My husband and I got married at a beautiful old mill on a warm spring day. It was an outdoor ceremony and we were surrounded by tall trees whose leaves were just bursting open, fresh tulips that had only been in bloom for a few days, and a serene waterfall splashing in the background. It was amazing! 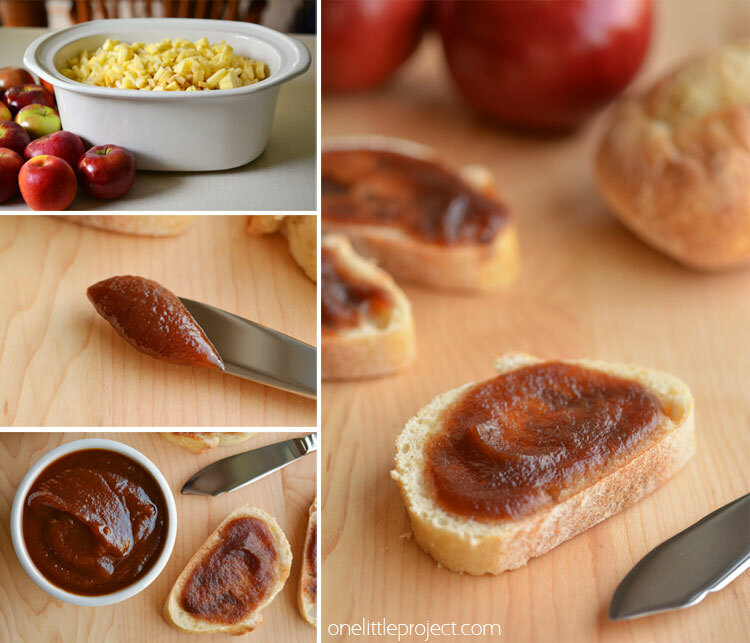 What does that have to do with apple butter, you ask? Well, when we went to the old mill to scope out the venue and book our wedding day with them, they gave us a small cloth bag with a jar of their homemade apple butter inside. I’m sure there were pamphlets and other papers in that cloth bag, but I’ll always remember the apple butter, because I thought it was such an odd thing to give to a future bride and groom. 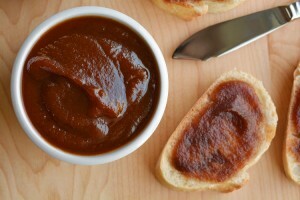 It was actually the first time in my life that I had ever even had apple butter. Happy wedding. 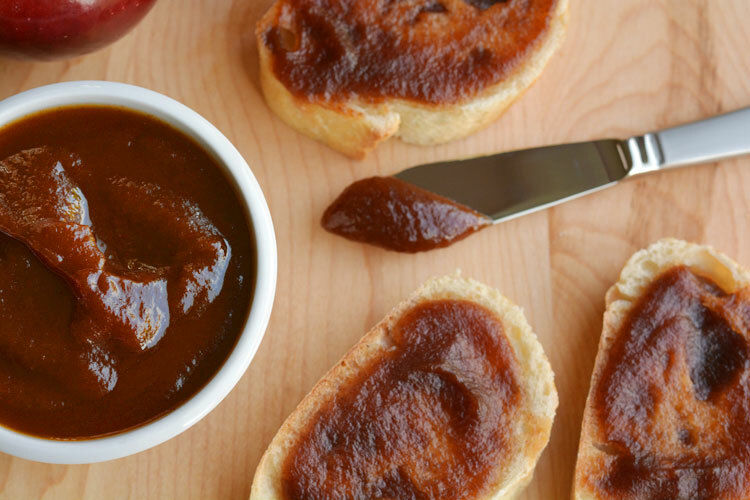 Happy apple butter. Funny how my mind associates those two things together now. 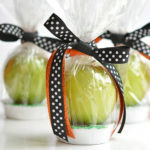 I used four different types of apples. I’m not an apple expert, and at the grocery store, I couldn’t remember which apples dissolved the best and which ones kept their shape, so I just chose a few different varieties. It probably doesn’t sound like the most scientific approach, but it seemed to work out in the end. 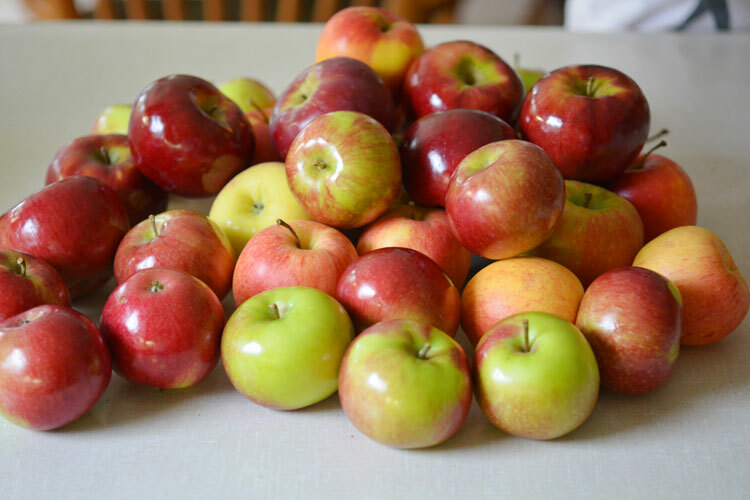 I had Cortlands, Macintosh, Sweet Honey Crisp, and Gala apples. This is the pile of apples that we used. We couldn’t fit all of them in the crock pot, so there were about 12 left over. Peeling apples is NOT my favourite job. I peeled a few by hand and then my husband and our 3 year old used our apple peeling contraption (coincidentally a gift we got for our wedding shower… see, the wedding related pattern goes even further…). The apple peeler is fun to use, but it took about the same amount of time to fuss with it as it did for me to peel them by hand. 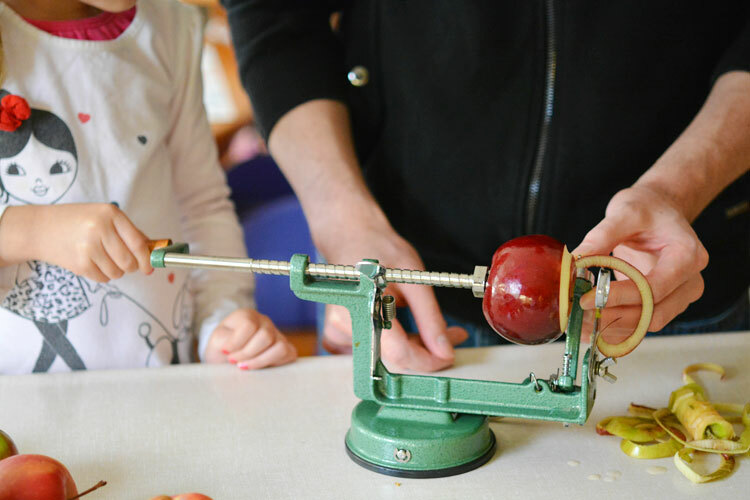 But our 3 year old was thrilled to turn the handle and watch it spin and slice the apple. We peeled a lot of apples. I didn’t measure exactly, but it was about 10 to 12 lbs of apples. We didn’t stop until our 5 quart crock pot was full. I started cooking it on low in the crock pot at 11am. 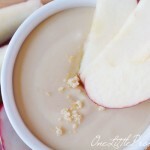 Unless you start really early in the morning, it’s hard to make this without going overnight. And I know I certainly don’t want to wake up at 2am to turn off the crock pot! I think the cooking time is pretty flexible as long as you cook it for at least 16 hours. 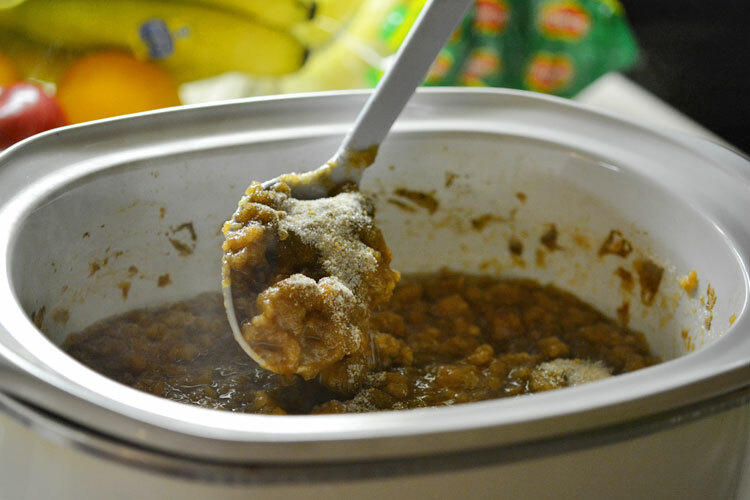 I let ours cook on low for 10 hours, then I added the sugar mixture and cooked it on low for another 10 hours. And then on high for 2 hours with the lid off so it could thicken up. So in total, it cooked for 22 hours, but that’s just because I didn’t want to get up in the middle of the night to turn it off. This is what it looked like after 10 hours of cooking on low. This was the point that I added the sugar and spices too. It turns out one of the apple varieties I chose didn’t dissolve very well, so I wasn’t getting the smooth consistency that I wanted. But it was no problem, I just used my hand blender to get it all smoothed out. It definitely got darker as it cooked overnight. I think maybe the cinnamon made it dark? Or maybe the brown sugar? I’m not sure? Either way, it still tasted amazing! It was the perfect consistency too, especially after I blended it. 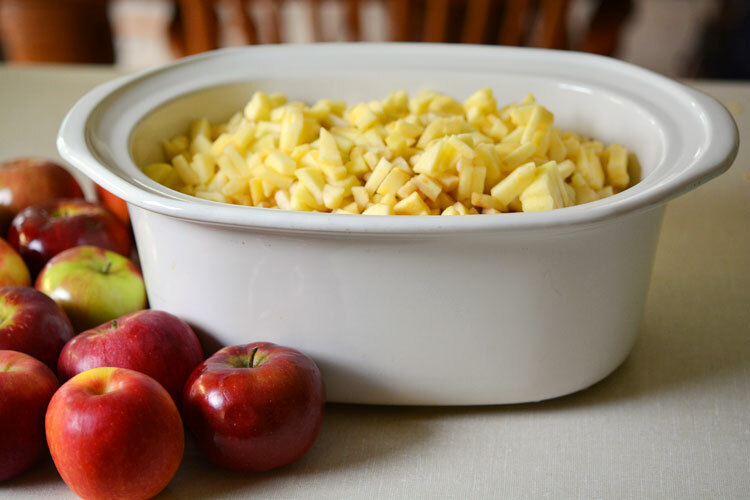 Peel the apples and chop them into small pieces. 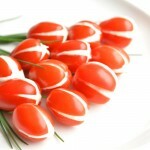 Place them in the slow cooker and add the apple cider vinegar. Stir until the apples are coated. Cook on low in the slow cooker for 10 hours. Add the sugar and spices and stir well. Cook another 4 to 10 hours. 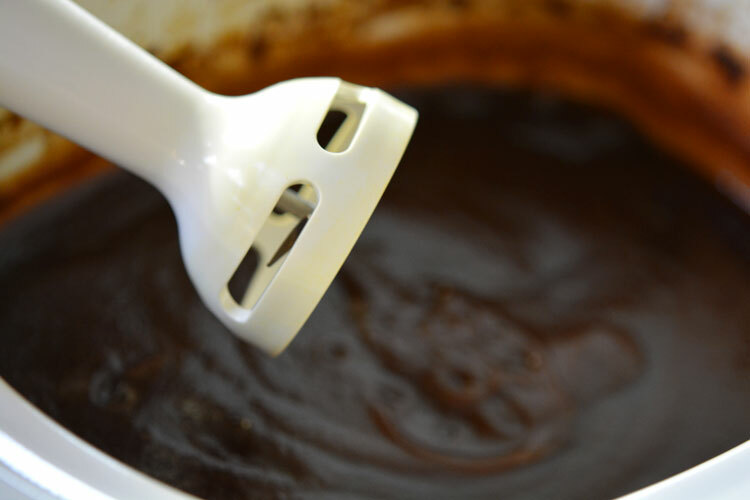 Blend with a hand blender to smooth out the consistency if needed. Cook, uncovered for 1 to 2 hours on high until you've reached your desired thickness. My recommendation is to start cooking this at 5pm on a Friday or Saturday evening. Let it cook overnight on low, then add the spices at 8am the next morning. Cook it on low for another 4 hours, then blend it, and cook it on high without the lid until it thickens up. Cooking times are flexible, so if you are off by a couple hours here and there, it's really no problem. 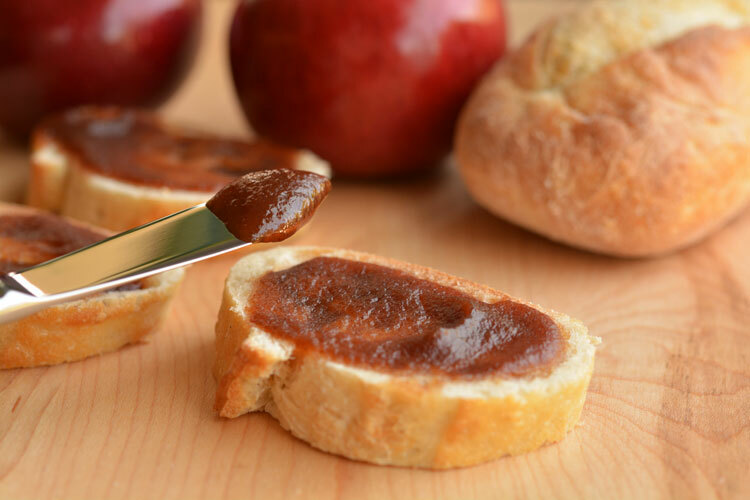 This recipe for slow cooker homemade apple butter is incredibly easy! The hardest part is peeling the apples and waiting for it to finish cooking. But when it’s done, it’s worth the wait. You can use it just like jam. 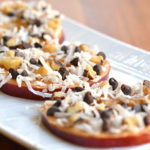 I had it on my toasted raisin bread for breakfast this morning and it was delicious! Oh my goodness this looks SO GOOOOOOOD!! Thanks for sharing with us at Mommy Monday! Pinned! How many mason jars will this fill? I made this twice last year and currently have 2 batches going! So so so good! Even my Mennonite neighbours love it! 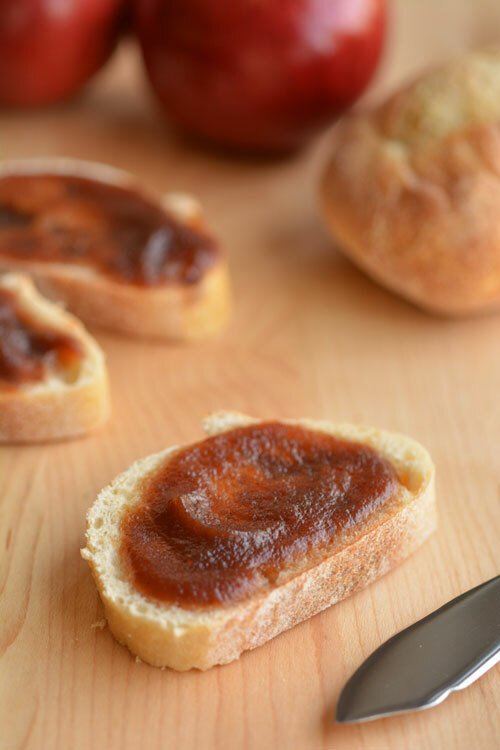 I made apple butter many times always delicious and held over a yr, I never processesed mine like canning peaches. Always just pour it in hoot sterilized jars and sealed tight with lid now a religion tells me after jarred must be processed like canning fruit do you process yours?